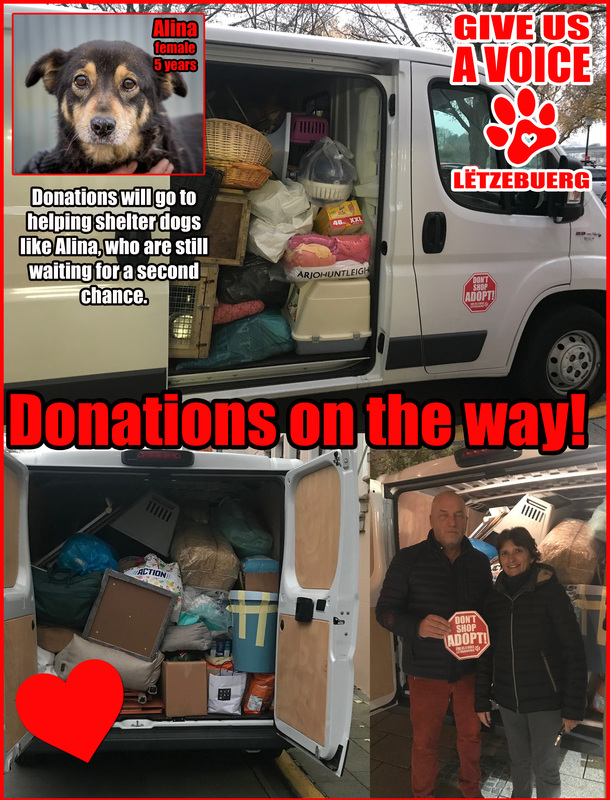 Thanks to our wonderful members, we were able to send a van stuffed full of donations to a few shelters in Hungary. The van was filled to the brim with food, blankets, beds, dog houses, supplies, leashes, toys and medicine. All of these things will be shared between a few different shelters that are in desperate need of donations to help get their dogs and cats through the cold the winter. We would like to thank our members for their continued generosity that allow us to make a difference in the lives of animals in need. We would like to give a big THANK YOU to Mme. Simone Chlecq and Garage Chlecq who loaned us a van in order to get these supplies to where they are needed most. We would also like to give a special thank you to Mme. Eva Kovacs for volunteering to drive the donations and for her tireless effort to help better the lives of the animals in Hungary. For more information on how you can adopt Alina, please call +352 691 140 001.